Their beautiful, passionate, and tragic story has moved and inspired lovers for centuries. Romeo and Juliet is a tragedy written early in the career of playwright William Shakespeare about two teenage "star-cross'd lovers" whose untimely deaths ultimately unite their feuding families. It was among Shakespeare's most popular plays during his lifetime and, along with Hamlet, is one of his most frequently performed plays. Today, the title characters are regarded as archetypal young lovers. Romeo and Juliet belongs to a tradition of tragic romances stretching back to antiquity. Its plot is based on an Italian tale, translated into verse as The Tragical History of Romeus and Juliet by Arthur Brooke in 1562, and retold in prose in Palace of Pleasure by William Painter in 1582. Shakespeare borrowed heavily from both, but developed supporting characters, particularly Mercutio and Paris, in order to expand the plot. Believed to be written between 1591 and 1595, the play was first published in a quarto version in 1597. The Chorus sets up the mood by telling the audience in the form of a sonnet that there is a feud between two families in Verona, a town in Italy. Amidst the warring sides, two "star-cross'd lovers" will die for love of one another, and it is only their deaths that will bring peace to Verona. The act opens on the streets of Verona, Italy, where two servants of the Capulet family begin to fight two servants from the Montague family. Benvolio, from the Montagues, temporarily defeats the Capulet servants until Tybalt, a noble Capulet resumes the fighting. It is the Prince of Verona, Escala, who succeeds in stopping the battle, claiming that it disrupts civil peace. Romeo soon enters, professing his love for a woman named Rosaline. Meanwhile, on another Verona street, the nobleman Paris expresses his desire to marry Juliet, Old Capulet's daughter. Old Capulet concedes to the marriage if Paris can win Juliet's affection; however, at the Capulet house, Juliet tells her mother that she has not even considered marriage yet. That night, the Capulets host a banquet. Romeo had decided to go because he found out that Rosaline will be there. When Romeo arrives at the banquet, he immediately falls in love with Juliet. After they meet and exchange words, she falls for Romeo as well. It is only until the lovers part when they realize the other comes from their rival family. 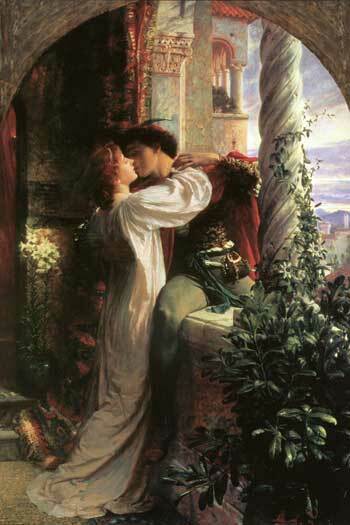 In the famous balcony scene, Romeo hides in the Capulets' garden to catch sight of Juliet. When she appears at a window, Romeo reveals himself. 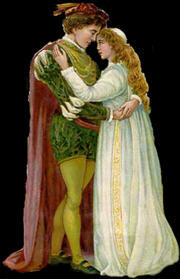 Both Romeo and Juliet express their love for each other and decide to marry, despite their last names. Friar Laurence decides to help the young lovers in an effort to end the families' feuding. Meanwhile, on the Verona streets, Romeo is informed that Tybalt has challenged him to a duel. Soon Juliet's Nurse enters, and Romeo tells her that Juliet should meet him at the Friar's cell so that they can be married. 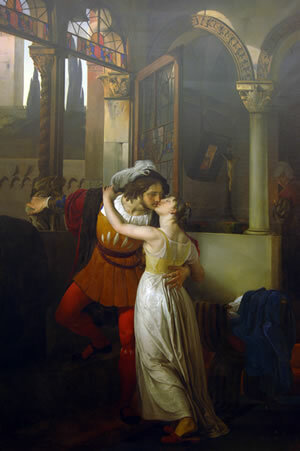 Juliet receives the message, and that afternoon, the lovers are married. This act opens with Mercutio and Benvolio discussing whether or not there will be a brawl. Indeed, when Tybalt and the Capulets, as well as Romeo, arrive on the scene, Tybalt challenges Romeo to a duel. Romeo refuses to fight him, and instead, Mercutio takes his place. As a result, Mercutio is slain by Tybalt, and in retribution, Romeo kills Tybalt. When the Prince finds out what had transpired, Romeo is banished from Verona. Juliet is soon told of the recent events, and both Romeo and Juliet are in great despair. The Friar tries to calm Romeo and persuades him to go to Mantua to wait for further instruction. And although Paris delays the wedding during the time of mourning for Tybalt, Old Capulet decides that Paris and Juliet should be married in three days. When Juliet hears of her father's hasty plan, she decides to go to the Friar for advice. At the Friar's cell, Juliet has threatened to kill herself. The Friar advises Juliet to drink a potion that will make her appear dead for forty-two hours. Because her parents will think she has died, she can easily escape to Mantua to be with Romeo. 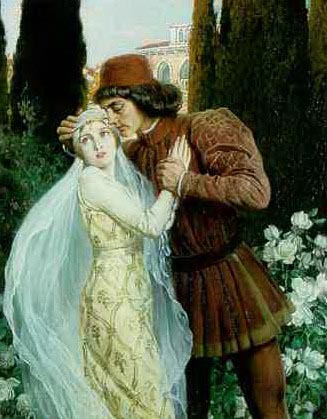 Juliet returns to her house, tells her father that she has changed her mind about her marriage to Paris, and then drinks the potion in a toast to her beloved. The Nurse enters Juliet's room to awaken her in preparation for the wedding, but finds what appears to be Juliet's corpse. In Mantua, Romeo receives news that Juliet has died. Not knowing the real story because the Friar's letter�which holds the complete truth�had not been successfully delivered, Romeo decides to take his own life and die alongside his beloved. Hearing that Romeo did not receive his letter, the Friar proceeds immediately to the graveyard, where Juliet awaits. When Romeo arrives at the graveyard, he encounters Paris. The two begin to fight, and Romeo slays Paris. He then approaches Juliet's tomb, believes her to be dead, and drinks the poison to relieve him of his grief. Friar Laurence arrives too late to see Romeo alive but just in time to see Juliet awaken. When he tells Juliet that Romeo has committed suicide, she follows suit, using her beloved's dagger to slay herself. Shortly, the Prince, the Montagues, and the Capulets enter, and the Friar informs all present of Romeo and Juliet's tragic love. The Prince blames the catastrophe on the warring families, and realizing that their feud has gone on too long, Old Montague and Old Capulet declare peace. the Romeo and Juliet Tile Swap Puzzle in our Tile Swap Puzzle section.